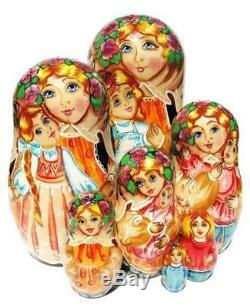 Mother 7-Piece Russian Nesting Doll. 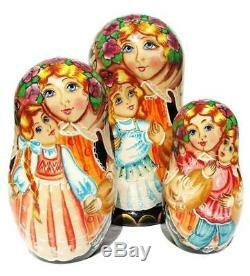 This beautiful nesting doll features mother surrounded by her loving children. It has lots of fine details and gorgeous contrasting colors. The entire collection is painted by water-based colors with an addition of sparkles and accented with a beautiful golden trim. It was covered with several layers of high gloss lacquer to create a stunning shiny effect. 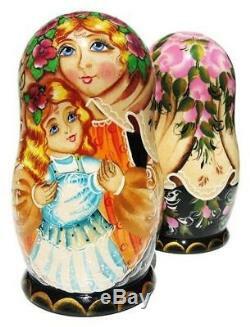 This babushka makes a wonderful gift for moms and grandmothers. Quantities are very limited and won't last long. Colors and patterns may slightly vary. Materials: lime wood, water-based paint, gold leaf, clear lacquer. The largest doll is about 8.0H. Listing and template services provided by inkFrog. The item "Mother 7-Piece Russian Babushka Matryoshka Stacking Nesting Doll gift" is in sale since Saturday, September 15, 2018. This item is in the category "Dolls & Bears\Dolls\By Type\Nesting". The seller is "greatrussiangifts-1" and is located in Post Falls, Idaho. This item can be shipped to United States, Canada, United Kingdom, Denmark, Romania, Slovakia, Bulgaria, Czech republic, Finland, Hungary, Latvia, Lithuania, Malta, Estonia, Australia, Greece, Portugal, Cyprus, Slovenia, Japan, China, Sweden, South Korea, Indonesia, Taiwan, South africa, Thailand, Belgium, France, Hong Kong, Ireland, Netherlands, Poland, Spain, Italy, Germany, Austria, Bahamas, Israel, Mexico, New Zealand, Philippines, Singapore, Switzerland, Norway, Saudi arabia, Ukraine, United arab emirates, Qatar, Kuwait, Bahrain, Croatia, Malaysia, Brazil, Chile, Colombia, Costa rica, Dominican republic, Panama, Trinidad and tobago, Guatemala, El salvador, Honduras, Jamaica, Antigua and barbuda, Aruba, Belize, Dominica, Grenada, Saint kitts and nevis, Saint lucia, Montserrat, Turks and caicos islands, Barbados, Bangladesh, Bermuda, Brunei darussalam, Bolivia, Ecuador, Egypt, French guiana, Guernsey, Gibraltar, Guadeloupe, Iceland, Jersey, Jordan, Cambodia, Cayman islands, Liechtenstein, Sri lanka, Luxembourg, Monaco, Macao, Martinique, Maldives, Nicaragua, Oman, Peru, Pakistan, Paraguay, Reunion, Viet nam.